Monks famously asked philosophical questions about trees in an empty forest and one hand clapping. How about this: can a person die if they never existed *as we do*? It was the question of the day at the opera for “The END”. When Louis Vuitton announced that they were lending designs for idol Miku Hatsune, it drew incredible attention from the industry. That’s because Miku is a so-called “vocaloid”, a computer-generated character and voice that sings and talks but doesn’t actually exist in tangible form. She has tons (TONS) of fans for sure, and even fills the Tokyo Dome when she has concerts (as a hologram, of course) but what was getting cooked up between her and LV to warrant such a collabo? The occasion was actually for this high-tech visual opera called “The END” that is starring Miku, so she needed some especially cool duds for it and LV was happy to oblige. In fact, they didn’t just “lend” the character clothes , Louis Vuitton designer Marc Jacobs and his design team made her special items based on the checkerboard Damier prints that starred in the SS 2013 collection. The graphical cubes and stripes lent VERY well to the 3D character and her world. (c)Louis Vuitton (c)Crypton Future Media Inc. So that was that, and I REALLY wanted to see the opera. So I was ecstatic when LV said they were having a press preview and reception celebrating the Tokyo showing of the opera and they invited me to see it. WHAT would an opera with Miku Hatsune be about? Well, with a title like “The END”, it didn’t come as a surprise that the premise was about death. 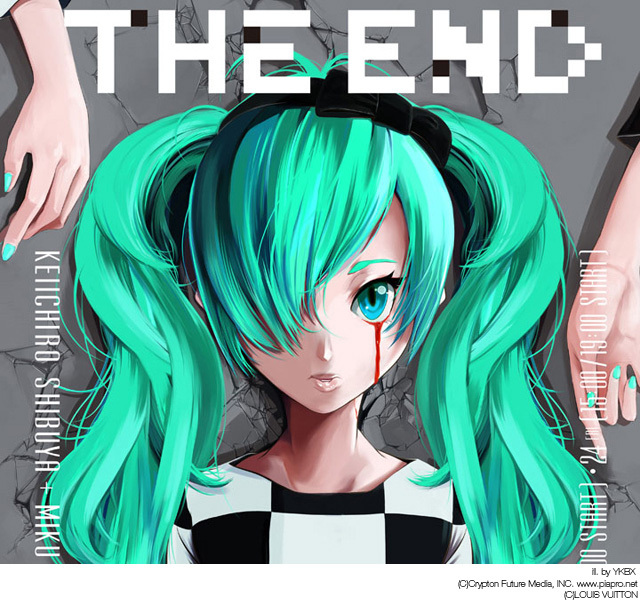 In it, Miku contemplates death, what it is, what it means to be dead, and whether it was OK.
As an art piece, it was utterly fascinating with jaw-dropping visuals, techno sounds and next-level sensory jams. As a story-driven narrative though, don’t expect a Disney happy ending. Let’s just say I will never trust another bunny robot I come across. So after the opera we all shuffled upstairs and enjoyed a great reception MCed by artist Sputniko! and we nibbled on food that us question our existence. Louis Vuitton has always been into boundary-pushing art (ie Takashi Murakami, Richard Prince) and this is no different. It reminded me of their Espace gallery above the Omotesando store and makes me want to go visit there again to see what other modern art they are pushing to the forefront. The END will also be shown in Paris on November 13th & 15th , so if you can’t make it to this showing and are into art that messes with the neurosis, you will want to try that showing too. OSAKA THIS WEEKEND! TIME TO GET MY NANIWA ON. FAN x PLUMB AND BIG BASH FOR PALETTE AT ONZIEME! GETTING AUDACIOUS WITH CHANEL PRE-FALL 2013 AND THE COOL-ELEGANT GIRLS OF TOKYO EMBODYING THAT SPIRIT.